There's a few ways that you can become part of our online community and begin learning from the best minds in rugby. Note: make sure that you choose a secure password that includes a mix of numbers and letters and ideally some upper-case letters as well. Next you can tell us a little more about yourself. This info will appear as a public profile visible to other users when you comment on videos and blogs. 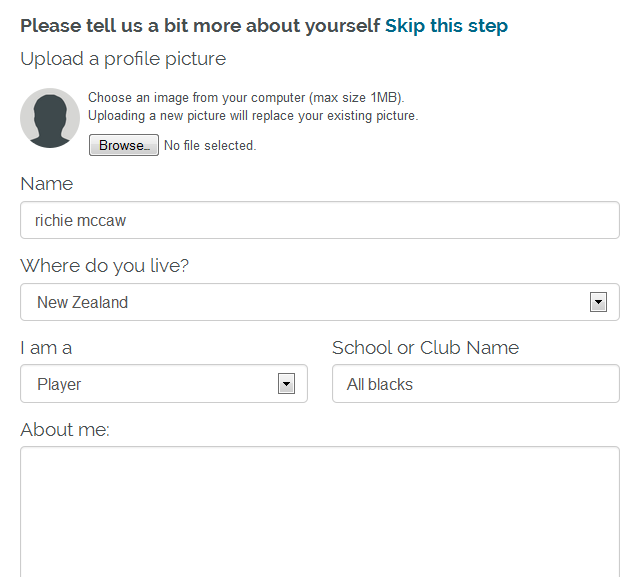 You can upload an image, write a bio and link to your website or blog. You can skip this step if you'd rather sneak down the blindside. Now that you have a profile you're free to browse the site. You can read and comment on the blog, watch video previews and free videos and you'll receive our email newsletter.